I started this blog on a whim three months ago, not sure how long I would keep it up and not even completely sure why I clicked the "create blog" button. I didn't tell anyone, including my husband, that I had a blog for at least a month and now my husband and children are the only ones in my everyday life who know about it. Because really, having a blog is a bit of an odd thing. You write down your thoughts and opinions on the internet for strangers to read, not because you have to and not because you are being paid to but just because you want to. The thing is, I find it much easier to have all you strangers reading what I write. You don't know me for real so you aren't reading everything trying to fit it in with the Jenny you know. You just read it for what it is and click away if you are not interested. However, I do have some observations after three months of blogging and you fortunate people get to read them. There is a whole world of people out there who read the same kinds of books that I do. That is absolutely fascinating. Where are some of you in my real life? I know people who like to read but they don't usually read similar books to me and their book addiction is not so over-the-top as mine. You people make me feel normal, because it is normal to constantly have book parcels showing up in your mailbox, right? No matter how much you say you are blogging for yourself, it really isn't true. There is always that voice in the back of your head hoping people will read the post you just wrote and hoping they will like it. If you were blogging just for yourself you wouldn't care. Sometimes the posts I work the hardest on and am the most pleased with are the ones that get the fewest views. I am not really sure what to take away from that. Blogs get labelled. I knew that, I knew there were food blogs and photography blogs and travel blogs, but I didn't realize that once you fell into a label there was a feeling that you had to stay there so you didn't disappoint your readers. After all, if you usually write about books is anyone going to want to read your post about your kids? I struggle with that a bit but I finally decided to write what I want within reason and you can read what you want. I think I lead a slightly boring, quiet life. I read other blogs and they are always going out to eat and traveling to amazing places and going out with friends. It makes for interesting blog reading but what I want to know is how do they find the time, money, and energy? (Hmmm. Showing my age right there.) I think I like my slightly boring, quiet life. Taking photographs is hard. That being said, I do a much better job at pulling my camera out in everyday life. Because I am aware of taking blog pictures I am aware of taking pictures in general. Most of them never are put on here but it is nice for us to have them. I feel like there is a whole world of blog etiquette out there and I am the person in a new culture trying to figure it out. If someone follows you do you have to follow them back? If you comment on someone's blog for the first time should you introduce yourself or just jump right in? It does feel a bit awkward, especially when I want to comment on blogs that have been around for a long time and the people in the comment section obviously know each other already. That being said, most times when I have commented on a blog people have been very nice and have responded. I really, really appreciate the ones who have then visited my blog and who now make regular comments. Twitter is really scary. I can post tweets about blog posts but other than that I am a bit terrified. What do you do, just tweet whatever is in your head at the moment? Oh my goodness, I overthink too much for that. I'll come to grips with Twitter eventually but that day has not come yet. I read somewhere that most bloggers quit within 90 days. I am still here. We'll see how the next 90 days go. I am curious. If you have a blog, do your friends and family know about it or is it your little secret? Congratulations on passing the 3-month mark! This is such a fascinating post. The blogging world as a whole is a cool place, though you're right, sometimes blogs get pigeonholed and labeled. But I for one don't mind if a book blogger posts about movies or toys or autumn leaves too -- I like learning about the people behind the blogs and what their lives are like. If a blog completely switches focus, like a book blog suddenly becomes a bird-watching blog, then I might unfollow, but only if it switches focus to something I'm not interested at all in. I lead a boring life too. I'm a stay-at-home-mom who home schools. I make my own fun :-) I'd rather stay home and read than go to a party. And I love finding other friends online who feel the same! And yeah, there's kind of blog etiquette, but kind of not. I don't feel compelled to follow bloggers who follow me. I follow too many blogs right now as it is -- I'm constantly falling behind on reading posts. Every year or so I go through and cull my list of blogs I follow, and then it slowly fills up again -- right now I follow 66 blogs, and I really can't keep up with more than about 50. Sigh. The blogging world is interesting, isn't it? I like finding out about the people behind the blog too. It gives a clearer picture of them and I am just interested in people. I am not a party person either. I find people in large groups very overwhelming. One on one or small groups are fine but big things are just exhausting. Give me a book and a cup of tea instead! My brother and sisters know about my blog. I was so excited in the beginning to share it with them - and they have never read it, as far as I know. I've mentioned it to some friends, who don't read it either. That was a bit discouraging, I have to say, particularly when it felt like I was just talking to myself - because I started blogging to have a conversation about books. But eventually as I started joining the conversation on other people's blogs, I began getting comments on mine - and also via Twitter, which I mostly use to talk about books. What I love about blogging is finding people who like the same kind of books, or who read as obsessively & constantly as I do. Like you, I don't have enough of those people in real life. I think of blogging as sharing the latest great book I read (and the occasional much less than great book). Anyway, I hope you will keep posting - I do enjoy reading along! I can't remember for sure, but I think you might be the first person who ever commented on my blog so thank you for that. It was nice to know I wasn't just talking into nothingness. Reading obsessively and constantly, yes, that is what I do. It is nice to know other people who understand that and who appreciate the same books I do. Twitter is still scary though! once in the last 18 months. I considered converting it to more than just films, but in the end, I decided not to. As you said, blogs get labeled...plus, my blog name, description, and URL indicate it's a blog about classic films. It seemed "wrong" to try to convert to something else. Anyhow, you have a lovely blog, and your blog title is awesome! That is a beautiful quote. I am glad you stopped by. Wow, 10 years of blogging, that is impressive. I have heard that blogging has changed lately. I don't mind if people want to make some money off their blogs but I don't like it when the blogs become impersonal. I really like to feel that I am getting to know the person behind the blog. I completely agree about quality over quantity. I feel that way in real life so it makes sense it would apply in the online world as well. A classic film blog sounds interesting. I will have to check it out for some movie recommendations. Thank you for your detailed comment. I appreciate it. 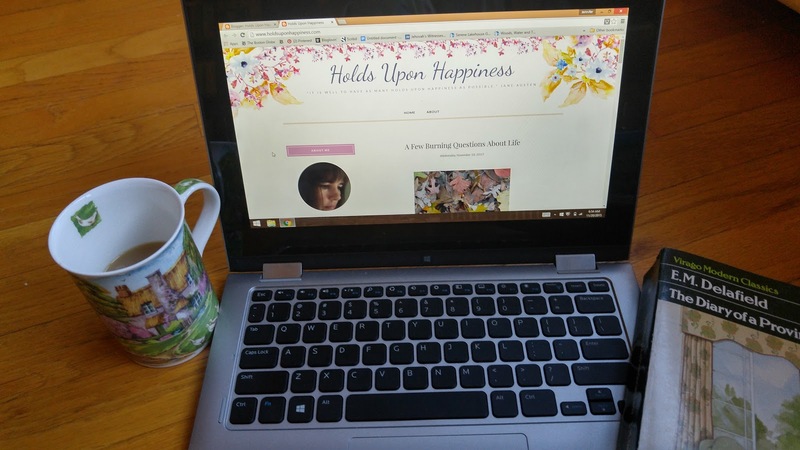 Beginning blogging can be a bit nerve wracking and having people comment is very nice.